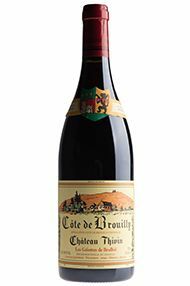 Château Thivin of the Côte de Brouilly appellation in Beaujolais has been in the hands of the Geoffray family since 1877. 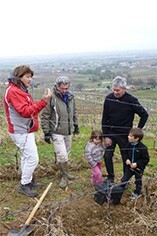 Today Claude and Evelyne Geoffray produce several different cuvees depending on the orientation of each parcel as the Côte de Brouilly hill has vines on all of its four sides. The regular wine blend is known as Sept Vignes (as there are seven different locations for their various plots), while they are increasingly introducing single vineyard cuvees. Exceptionally steep slopes of granite and schist endow the best wines of the Côte de Brouilly with a complexity and minerality rarely found in those of the flatter vineyards of Brouilly (a separate Cru, which loops around the first). In 2017, this cuvée’s mineral core seems enrobed in rich, ripe dark fruit, suggestive of the vines’ location – a south-facing parcel, mid-slope (where cherries once grew, hence the name). It’s a seductive prospect now but will only improve with time in bottle. Drink now to 2023.